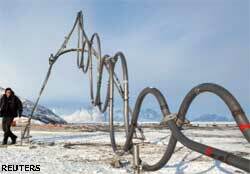 Dutch artist A P Verheggen has made two swirling metal sculptures representing a dog sledge. They are installed on an iceberg in western Greenland. The purpose is to highlight how the ice sheets, thinned by global warming, are a threat to Innuits. People will be able to monitor the melting of the iceberg as the sculptures drift away, Verheggen said. Haiti’s president, Rene Preval, said he would ask the US to phase out food aid to his country that is struggling with the aftermath of the earthquake in January. Aid competes with Haitian-produced food and so risks undermining an economic recovery, Preval said. Oil-rich Argentina plans to import petrol for the first time in 30 years as demand outstrips supply in the South American nation. Havana plans to close 100 “inefficient” state-run agricultural enterprises as part of President Raul Castro’s agricultural reforms aimed at increasing food production. Cuba imports 80 per cent of its food needs. Doctors in the Iraqi city of Fallujah claimed a growing number of children are born with birth defects due to the weapons the US troops used during a fierce fighting six years ago. They are demanding an authoritative medical investigation. China plans to extend its high-speed train network to Europe. Though the route is yet to be finalized, when completed passengers would cover the 8,000-km journey at 320 km a hour in two days. The unilateral move by Unilever to stop buying palm oil from Indonesian suppliers is unfair, said the country’s agriculture minister. Unilever, the world’s top palm oil buyer, cancelled its deals following complaints by green groups that palm oil firms cause large-scale deforestation in Indonesia. Conservationists at the Convention on International Trade in Endangered Species (cites) suggested regulating shark trade saying sharks are being fished faster than they can reproduce. Shark fins are in demand for soup recipes in Asian countries. As world powers mull a new round of sanctions on Iran, Tehran said it is willing to swap its low-enriched nuclear fuel, suitable for nuclear weapon, with highly-enriched nuclear fuel from the West; it is good for medical research. The exchange should be simultaneous and on its soil, it said. Nine countries in Africa’s drought -affected Sahel regi-on met in Chad to find ways to manage scarce food and water supplies, which are critical in Niger and Chad. Czech environment minister Jan Dusik resigned saying the prime minister was putting pressure on him to decide hastily on plans to revamp a coal-fired power plant, listed as one of the biggest polluters in Europe. Turkey’s prime minister has threatened to deport 100,000 Armenian migrants living in Turkey without citizenship, after the US and Sweden passed resolutions defining First World War-era killings of Armenians by Ottoman Turks as genocide. Most migrants came to Turkey after an earthquake in Armenia in 1988 and are working without permits. The number of crop seeds in the global seed vault has crossed 500,000 samples, making it the most diverse collection of food seeds in history. Set up in Norway’s Svalbard archipelago in 2008, the vault is designed to protect the world’s seeds in the event of a disaster. Slovenia, which has the highest density of brown bears in Europe, has allowed limited killing to contain the harm they do to crops and livestock. In a court settlement, New York city officials agreed to pay up to US $657.5 million in compensation to over 10,000 rescue and clean-up workers at Ground Zero of the 9/11 attacks. They had complained of sickness due to dust from the collapsed World Trade Center towers that had particles of lead, glass, asbestos and cement. Canada’s parliamentarians ate seal meat in the canteen as an expression of solidarity with hunters angry at a EU ban on seal products.